Core exercises are all the rage in the fitness world. Look in any fitness magazine, or really any magazine for that matter, and you will find some kind of tip or technique for getting a flat stomach, or six pack abs. The importance of core strength and abdominal training is not completely overrated. 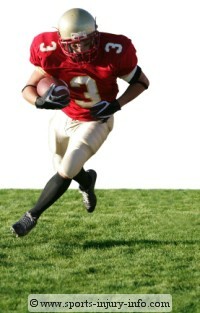 It is a key component to any type of sports injury rehab program. There are so many different core exercises out there, it can get very confusing. Why The Core Is So Important? When I talk to my patients about the importance of core strength, I always us the analogy of building a house. If you build a house with a sturdy foundation, then you can add two or three stories without worrying about the house being stable. If you build the house on a poor foundation, then each story becomes progressively less stable. The body is the same way. Everything is connected, and the farther away from the core you get, the less stable joints will be. If you have a strong and stable core, then you have more stability in the joints of the arms and legs. The abdominal muscles are the primary stabilizers of the core. With this said, not all abdominals are created equal when it comes to stabilizing the body. The lower abdominals are the important muscles for core stability. These are not the "six-pack" abs that you think about. The lower abdominal muscles, including the transverse abdominus, are low on the trunk, and they help to stabilize the pelvis. The transverse abdominus lies deep, or underneath the Rectus Abdominus. These are the six pack abs you strive for. The internal and external obliques run along the sides of the trunk from the ribs. If the pelvis is stable, you can produce more power and have better balance when using the legs and arms. The problem with most athletes when it comes to core stability is that they do not properly target the lower abdominals. People focus on the "six-pack" abs, and forget the stabilizing transverse abdominus. And so the hundreds of crunches that are done with their abdominal training program do little to help improve their athletic performance. 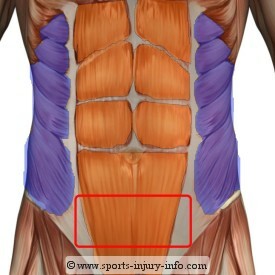 The transverse abdominals are stabilizing muscles. This means that when they contract, they do not produce movement of a joint, but rather they tighten everything down and prevent movement. The rectus abdominus and obliques produce movement of the trunk, like a crunch or twist. In order to target the core for stability, you have to engage the lower abdominals in an isometric or stabilizing contraction. While everyone I know would love to have awesome six pack abs, this is really not important in improving athletic performance, or in sports injury rehab. The key is learning how to use your lower abdominal muscles to improve your stability. It will give you greater power, and work to prevent injury in the long run. So how do you get a strong and stable core. Through targeted core exercises that focus on stabilizing the trunk, and then performing other movements with your legs and arms. Remember, it all starts with a stable base. The abdominal crunch is the simplest of exercises for training the core. There are hundreds of variations on the crunch, from simple sit ups, to specialized abdominal equipement. Remember though, that crunches don't necessarily target the stabilizing core muscles. I like to have my patients perform fitness ball crunches if they are going to be doing this type of exercise. Fitness balls allow for a greater range of motion, and require stability in not just the core, but also the hips and low back. Foam rollers can be used for abdominal training, and they can also have lots of different variations. Using medicine balls for abdominal exercises is also another great way to target the core. Push ups and planks are two other great core exercises that are often overlooked. If done correctly, the push up is an excellent ab exercise, and is a great way to improve functional stability. The key to great core stability lies in the ability to contract the lower abdominal muscles at will, and then maintain that contraction while the rest of the body works. The lower abs are not easily contracted, and so it does take some training to get them up and working. All of the abdominal exercises on this site are meant to target these muscles, and to produce great core stability. Core exercises are vital in any rehab program following a sports injury. And they are a welcome addition to conditioning and prevention programs. A strong and stable core will help improve your performance, as well as prevent and treat injuries.